The biggest problem facing most cats today are boredom, inactivity and obesity. Think about it - we've taken a species whose ancestors spent countless hours each and every day collecting enough food to survive, and moved them indoors with near constant access to food that never tries to escape from them. The solution to this problem is simple; promote an activity that every cat enjoys - hunting! Now, I'm not saying to ship your cat outside and let him bother the birds, or to introduce some mice to your home, but there are some simple enough changes that can support a cat's natural inclination to hunt. Make your cat move for their food! Divide their meals into multiple small servings, and place them in different areas around your home. If your cat has no issues with mobility, you can even get creative and place food on different levels, requiring them to use stairs, jump, or climb for their meals. When cats are left on their own, they tend to eat 8-10 small meals per day (think of the barn cats chasing mice). While that number is difficult to reach for most cat owners, even increasing the number of meals from 2 to 4 can have a significant impact. To avoid over feeding, try placing the amount of of food for the day in a container (including treats too) and make sure that everyone knows that when the container is empty, the cat is done for the day. A quick search online will reveal all sorts of puzzle feeders designed for cats. You can find variations on the traditional kibble-loaded ball with holes that dispense food as it rolls. However, there are also more elaborate puzzle feeders are also available, including machines with tubes of various heights or numerous compartments that have to be reached into or opened to reveal the meal. Rotating through different types of puzzle feeders will keep a cat's interest better. Teach your cat a trick like fetch the cotton swab and reward them with treats, or make sure he watches while you place a few pieces of kibble on the floor and cover them with a thin cloth. What does he do when you slowly drag the cloth away? What does he do when you quickly throw the cloth away? 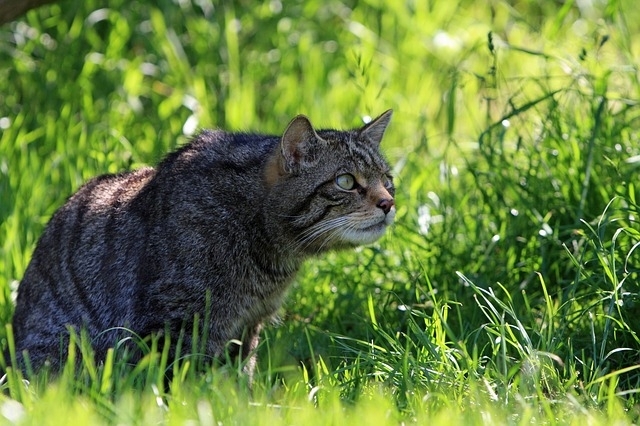 Cats need to 'hunt' to stay mentally and physically sharp. With a little creativity, cat owners can find simple ways to support this normal cat behaviour and ward off boredom, inactivity, and obesity.